I sat in on the Small Biz Online Marketing Seminar at SUNY New Paltz not sure what to expect, but knowing that the three panelists are digital marketing experts who know their stuff. The event was organized and sponsored by Dragon Search Marketing and the Mid Hudson Valley Digital Marketers. Raleigh Green from Raleigh Green Inc., Aaron Mandelbaum of Ice Breaker Consulting, and Jason White, SEO genius of Dragon Search Marketing. 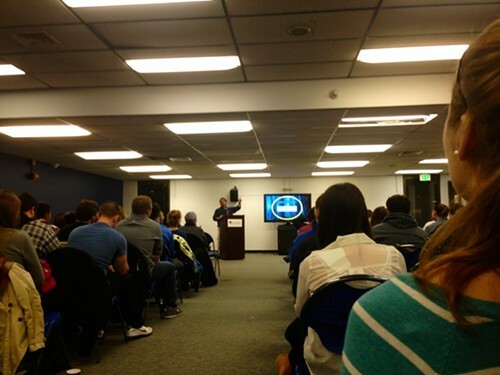 The audience of about 200 were small business owners, SUNY New Paltz students, and marketers. 1) Avoid having an Aol address or Yahoo address on your business card or website. It sends the wrong branding message. ( I tend to agree with this though if I see a Yahoo address on a website and I really want to email the business, I don’t hesitate). 2) Buy all your domain names, not just the .com. For example, get suebagels.com, suebagels.us, suebagels.net, so a competitor or someone else doesn’t buy it and confuse your online audience. 3) Don’t slap your newspaper ad on to your website. Online visitors will want to know that you have free shipping. They won’t care about your brick and mortar operation. 4) “Rankings don’t pay the bills,” says Jason White. White calls that a “garbage success metric” that can’t be won. Don’t focus on things you don’t understand and you have no control over. Instead focus on your message, traffic, and branding. 5) Reach out to bloggers! Yes, that means connect, advertise on, and follow people like me, Hudson Valley Good Stuff, Watershed Post, Family Friendly Hudson Valley, and Happy Hudson Valley to get your brand out to readers who are connected to the Hudson Valley. 6) My favorite line came from Mandelbaum who said that capturing email addresses has become the equivalent of getting the bedroom keys in the online world. There is immense value in capturing an email address these days. 8) Start a blog on your company’s website to attract more traffic. 9) Reach out to publishing companies and journalists and frame your pitch as your story. If you can’t get through to an editor, try getting through to an intern. HARO (Help a Reporter Out) is also a great source for getting your story out there. 10) Remember to register your domain name and business with Google, and Google Local, and look into every social media site that is out there. (It seems like there is a new one born every minute). 11) Having a mobile-friendly website is important. You can tell what percentage of visitors to your site are using smartphones, by analyzing your Google Analytics. If your site isn’t mobile-friendly, at the very least, make sure your phone number and contact info is easily visible and clickable. That is just a snippet of what was discussed. At the end the panel opened it up for questions. I left before the end, but there were a few interesting questions raised, “What is Google Plus, and why should I care?” and “What to do about negative reviews?” I had to leave before the Q & A was over, but it was very educational and entertaining 2 hours. I’m looking forward to the next Small Biz Online Marketing Seminar by the Mid Hudson Valley Digital Marketing group and Dragon Search. A fellow content writer who sat next to me thought that next time they should have a quick primer on blogging. I see a “Blogging De-Mystified” presentation for 2014 and speed-networking affair too! I arrived there 10 minutes late so I didn’t get to network at all, but White introduced me to the audience and gave me a quick shout-out so now more people know about Hudson Valley Good Stuff can help them get the word out about their business. Always appreciated! Thank you Dragons! Vanessa Ahern founded Hudson Valley Good Stuff, a blog dedicated to where to eat, play & recharge your spirit in 2009.